Fall Finale 11/5-6 @ Summit Point! Registration is closed for our final 2011 event. perhaps other groups also – please email Jon. Entry list, schedule, and participant details are on the event page. See you soon for one more weekend of fast fun! VIR OktoberFast – This Weekend! 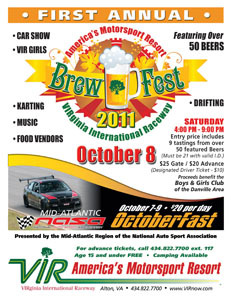 UPDATE: NASA participants get into the BrewFest for half price ($12.50) – or for free by visiting VBD Graphics in the paddock. Details will be announced at the drivers meeting on Saturday morning!